Sarah Palin endorsed Carly Fiorina in the California Senate race on Thursday. Washington (CNN) - Sarah Palin broke ranks with the conservative movement on Thursday and endorsed former Hewlett-Packard CEO Carly Fiorina in California's Republican Senate primary, prompting a flurry of criticism from many of her loyal supporters. After Palin announced the endorsement on her Facebook page, a number of her followers questioned why she would side with Fiorina instead of the more conservative candidate in the race, Assemblyman Chuck DeVore. DeVore has the backing of several leading voices in the conservative movement, including Sen. Jim DeMint, RedState.com editor Erick Erickson and the Tea Party Express. Though a handful of readers agreed with Palin's decision, most were upset. "This is very, very disappointing," Rick Sheridan, one of her supporters, posted on Palin's page. "Sarah, you've got to be more careful. This woman does not represent conservative values. And the choice is so clear. Serious damage to your base here." "Wow, Sarah...I'm saddened and shocked by your decision to endorse Carly Fiorina," commented another backer, Jennifer Goode. "Had you done your research, you would have found that Chuck DeVore is the ONLY true conservative in the California Senate race." Also in the GOP race is former Rep. Tom Campbell, who has maintained a steady lead over his opponents in recent polls. The Republican nominee will take on Sen. Barbara Boxer in the general election. The former Alaska governor explained her decision to wade into the primary by taking a shot at Campbell - but she made no mention of DeVore. "I'm a huge proponent of contested primaries, so I'm glad to see the contest in California's GOP, but I support Carly as she fights through a tough primary against a liberal member of the GOP who seems to bear almost no difference to Boxer, one of the most leftwing members of the Senate," Palin wrote. DeVore spokesman Joshua Trevino said the swift reaction from conservatives online speaks for itself. "I think the best I can do is point you toward the responses from the conservative base on Palin's Facebook page, and on Twitter: there's a lot of them respectfully but firmly telling the former Governor that she's been misled here. And they're right," he said in an email. Palin also irked some conservatives earlier this year when she endorsed Sen. John McCain, who elevated Palin to the national stage, in his Senate primary battle against former Rep. J.D. Hayworth. Her loyalty to McCain may have been a factor in the California race, as well. Fiorina was one of McCain's economic advisers during the presidential campaign, and last year she told reporters: "I share Sarah Palin's values." UPDATE: Fiorina's team disputed the notion that Palin's endorsement is inconsistent with the the Tea Party movement. Spokeswoman Julie Soderlund pointed to a recent Field Poll that found Tea Party supporters prefer Fiorina over Campbell and DeVore. "Whether or not Chuck DeVore wants to admit it, Carly is a conservative and political outsider," Soderlund said. Campbell's campaign, meanwhile, said the endorsement is nothing more than an "IOU from the 2008 election cycle." "California voters are not buying that a failed CEO can be an effective U.S. Senator," a Campbell spokesman said. "Voters are looking for a Republican with a balance of experience, a real record fighting wasteful federal spending and the ability to defeat Barbara Boxer - and poll after poll says that Republican is Tom Campbell." UPDATE 2: Palin updated her Facebook post after the uproar and listed Fiorina's conservative credentials, including her opposition to abortion rights, her support for gun rights and opposition to "Obamacare." "And most importantly, Carly is the only conservative in the race who can beat Barbara Boxer," she wrote. "That’s no RINO. That’s a winner." Palin endorsed a loser like herself. She has no real credibility on such matters, I'd heed the advice of my hairstylist before I depended on an opinion from the likes of Palin. She simply did what she always does. She looked out for herself. Backing a winner is better than backing a loser for her. Ideology has nothing to do with it. She is a very shallow person who thinks only about her own fame and fortune. It is a hideous disappointment that she was ever put into the public limelight. Now we have to keep seeing this brainless yahoo over and over again. Shouldn't she be cleaning up the Louisiana coastline right now? Who would want the endorsement of a quitter? I wish the Republican party had more people like Sarah. She is a smart, tough, effective woman who can truly get things done...like destroying her own party, for example. But wait! Did I say "smart"? Sorry, I meant to say "stupid." Her endorsement doesn't mean scratch. She's nothing but an airhead who can't think on her feet and only quit the governorship so she wouldn't fade into obscurity up in Alaska. She loved the media attention during the 2008 presidential campaign and afterwords couldn't stand being out of the news, thus, her reason for quitting on Alaska and its people. Unfortunately, her supporters or "tools" can't face up to the fact that she's just a political caricature of 'stupidity" and contributes nothing for the betterment of America. She just criticizes the Obama administration on every issue from talking points she gets from her overpaid consultants. She's clueless and mainstream media refuses to call her on it. 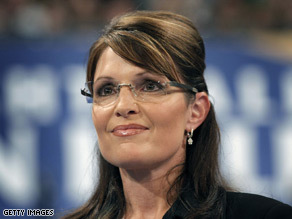 I have a simple question: the caption of this article states "Palin irks her supporters......" Supporters of what??? She isn't running for anything, last time I checked. Fiorina is an incompetent who couldn't hack her job at HP and got the boot. And who has attracted the support of Sarah Palin. No surprises here. 'Nuff said. Fox and Clear Channel are only using Palin to split the social conservative vote and help their Wall Street Man Mittens Rmoney in 2012. So a loser backing a loser is news ? So why is anybody confused by this? Fiorina ("fired by HP for incompetence") = "Money Huckster"
Money Huckster >> Money Sucker !!! Probably got lots of $$ from that HP Crook who caused misery on HP and its near downfall, then walked away with a $20 million golden parachute for her failures. Now that wretch probably gave Palin lot of money and Palin of course like the hypocrite she is, just read off what was handed to her. I mean, listed to the words – it doesn't even sound like Palin talk. Its more refined and has more vocabulary. Definitely penned by Carly. I still can't figure out why she has not yet gone the way of Joe the Plumber. I'm surprised more haven't figured it out yet. Sarah Palin is about Sarah Palin and she'll do whatever helps her. Honestly as an independant I don't know why the GOP and the teabagers are in an uproar over anythign this person has done or shown. 22 months ago she was a nobody who struggled as a governor. Then she was push into the limelight, has embraced it, quit her job as an ELECTED official and has now charged $100k to speak at events. WHY ? WHat did she accomplish the McCain,Romney, Huckeby or any other elected official has ? The differance is they dedicated their life for their government and she hasn't !! Period, end of story. I really get the tea party movement just not why they chose to use gas to light the fire, instead of letting the fire burn bright for a long time The movement chose to throw her ( the gas ) on and let the fire burn out of control and now to me the cause seems lost. "California voters are not buying that a failed CEO can be an effective U.S. Senator," a Campbell spokesman said. Carly Fiorina did an excellent job as CEO at HP. Her strategies have paid off well for the company. At the time, the family members ( i.e., wealthy 2nd generation brats ) on the board did not want to buy Compaq, but it turned out to be a good decision, both for American workers at both companies and for the business. So, Campbell is taking sides with the brats in this case? Interesting strategy. It took awhile, but I knew that she would eventually tick her supporters off. She doesn't understand politics evidently. You have to toe the line or you will be dumped. Bye, bye, your 15 minutes were up 20 minutes ago. Seriously, this IS NOT SURPRISING. Sarah Palin has NEVER had any idea of what she is doing. She endorses candidates when she DOES NOT know anything about them. Sarah Palin is uneducated and very inconsistent with everything she does. Why doesn't anyone see this?! The Democrats LOVE her because she is consistently tearing apart the GOP. PLEASE KEEP SARAH PALIN, GOP. You will hand over the 2012 election to the Democrats on a GOLDEN PLATTER!